Did you know that companies with happy employees see a 26 percent increase in annual income? This means that employees who feel engaged in their job will be more productive. 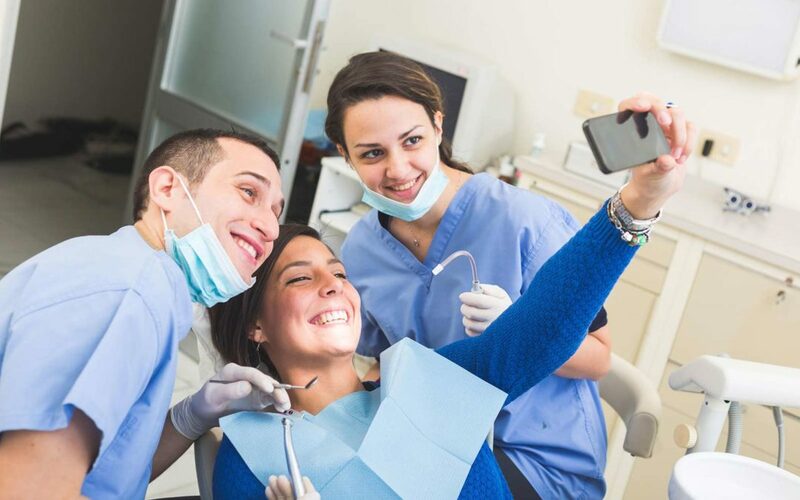 Have you assessed your dental office’s morale lately? It’s okay if you say no. You’re in the right place. Employee morale is monumental in increasing productivity, efficiency, and the client experience. Not only will your employees enjoy coming to work, but they’ll want to keep coming back. Ready to increase your office’s morale and engage your employees? Keep reading for ten creative ways to boost team spirit. In the dental setting, you’re often working in close quarters with your colleagues. But, this doesn’t mean you feel comfortable discussing issues. Where can your employees bring up their questions or concerns? Create an open line of communication. Being approachable and welcoming encourages employees to talk candidly. Through their feedback, you’ll learn ways to improve the office and your services. As the boss, your door should always be open to your employees. Making them feel comfortable to talk openly with you will boost office morale. It’s all too common for employees to eat a quick lunch in the back room. Many don’t even take a full hour because they know there’s a lot of work to do. Don’t let this become a habit in your dental office. Make sure every employee gets a full hour to enjoy their break. Let them know they can leave the office and get outside if they want to. Show them that their break is important to you. Employees encouraged to take breaks will return to the job rested and ready to go. How exciting is it when an employee hits a work anniversary with your office? It should be super exciting! It proves they’ve committed to growing with your business for that milestone of time. Make it a habit to record start dates and set alerts for milestones. Every year do something special on that anniversary. You could pay for their lunch, give them a gift card, or let them leave early that day. Whatever it is, show how much you appreciate their commitment. Your gratitude will make them feel honored to work in your office. It’s a given that your employees have paid vacation time each year. If they don’t, you need to catch up and get that in place. Everyone deserves time away from the office to recharge and enjoy their life. One way to boost employee morale is to increase their paid vacation time. Even if it’s only by a couple days, it makes a difference. Consider adding one more sick day to the program. You could even award the day off on their birthday to make it extra special. Show your employees you value their time off as well. You want them to have a fulfilling home life because that makes them a happier worker. More and more companies are starting a Culture Committee to focus on office morale. These are teams of employees who plan work events, potlucks, and other fun activities. They could plan a monthly fun event for all the employees, like an escape room. Not only is it fun, but these outings are great team building opportunities. When your employees feel part of a team, they enjoy their work more. They’re more willing to help each other and take initiative. If you’re concerned about the cost, ask if they’d be willing to contribute a couple dollars each paycheck. Did you know that one in three workers today are millennials? Millennials differ from older generations in their workplace expectations. These young professionals aren’t going to stay anywhere that doesn’t have clear room for growth. And, it’s not just room you need to provide; they want a transparent and clear path. You need to set up a promotion and raise program that rewards time spent at the company. To keep these bright young workers in your clinic, they need to feel encouraged often. Being transparent in this program holds you accountable. It also makes you more trustworthy to employees which will spur their loyalty. Dental offices are often very clinical and sterile feeling. If you want to boost morale, take everyone out of the office. Have your staff meetings outside on the lawn. Or, at the coffee shop down the street. Take everyone for breakfast before the office opens. It’s important to get to know your employees outside the clinical setting. It allows everyone to see each other as humans, not “boss” and “employee”. Who doesn’t love sweet discounts or free stuff? Your employees certainly do. Consider making partnerships will local businesses near the office. They will give your employees discounts in return for discounts at your office. Win-win. This gets added to the list of perks of working in your office. It also builds your reputation in the community. Your employees can feel proud to work for a company so engaged with fellow businesses. We mentioned above that dental offices often feel sterile. While this is necessary for health and safety, there are some areas you can be lenient in. Staff rooms or break rooms don’t have to be as faceless as they are. By creating a more welcoming space, employees feel more comfortable to be themselves. Consider putting up a bulletin board for the Culture Committee and other announcements. Encourage employees to post family pictures or funny jokes. Adorn the room with plants, art, and comfortable seating. It’s shocking how much this does to increase employee morale. Ready to Boost the Employee Morale in Your Office? The employee morale in your office directly affects productivity. Your customers feel when the morale is off, and that affects your revenue. When employees feel safe, comfortable, and happy at work, they’re more productive. They also take pride in working for your company. Things can only get better when morale is increased. For more tips and strategies to improve your dental office, check out the blog. Better Practice Solutions helps growing dental practices throughout Westchester, Putnam and Dutchess counties that struggle to get their insurance claims processing optimized.